Search Results for "sick pet"
Veterinarian using a stethoscope to listen to cat's heart, sick pet, purebred british cat. Pretty Ukrainian girl sitting nice cat on examination couch, stroking. Veterinarian turning light and beginning to examine sick pet. Indoors. Vet clinic. Pet dog with sick man in bed with thermometer and ice bag on head. Handsome veterinarian with beard examining ears of sick cat. Young Ukrainian woman keeping pet. Vet clinic. Close-up. Vet examining ears of sick cat, using medical equipment. Owner of pet standing nearby. Medical examination of Scottish fold. Close-up. Couple of newlyweds bring a sick cat to see a veterinarian. 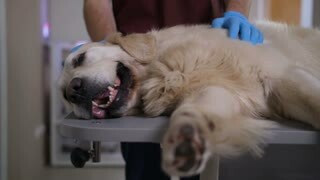 Young people tell the symptoms of a pet's illness to the doctor. Close-up. 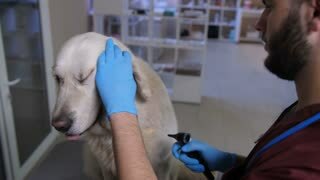 Caucasian vet examining sick dog in health institution. Nice guy, owner of French bulldog, talking about symptoms of pet’s illness. 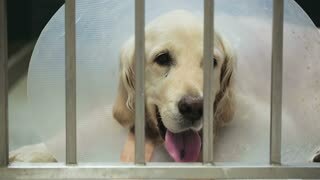 A golden retriever dog in a vet clinic cage.